No one in Singapore can want to see his/her cloth stained whether it is new or old. Just like any other part of the world, Singapore is an ever busy place and sometimes people may not find time to deal with the stains on their clothes. However, you can be interested and give it a try, to remove stains on your shirt by yourself. In this case, what you first need to understand is that the stain removal on your shirt depends largely on three main factors. These include the stain nature, the fabric type and the colorfastness of the dye. It is also important to know that the stain removal agent you are using may not work for some fabrics and dyes like ink and dried paint may be impossible to remove. It is also advisable that you do not iron your stained or soiled shirt because this will simply drive deep the stain into the fabric making the stain even harder to remove from the shirt. Though you can prevent stain setting, this is still not sufficient because not all the stains will get removed just by dabbing water on them. However, there are some basic steps you can take to get the stains completely removed from the shirt. The following are the steps you need to take. Large percentage of the household products can be treated with the common commercial products or food supplies. As you choose the solvent, try to understand what dissolves the stain you are handling the safety of appliance on the shirt that has the stain. Using a wrong product may land you into damaging the cloth. The best way therefore to go about it is to look at the label on the shirt. This is always the best guide you can ever get for that particular cloth. The main thing you need to look on the label is the type of the fabric. 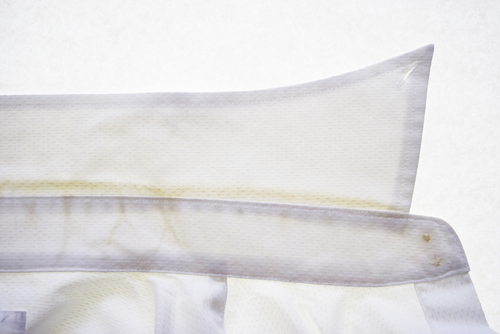 The following are the common fabrics and how to remove stains from them. Wool is very sensitive to heat and needs gentle treatment. Ensure that you lay the shirt of this fabric flat after soaking to prevent any distortion. You can treat it with lukewarm water or any other wool-safe detergent. You need to do this as fast as possible then get it on a dry cleaner at the first opportunity. This type of fabric can endure soaking, heat and drying. Feel free to use warm water on it. It is also very do bleaching on a white cotton though it may seem to be hard on the fabric. You can therefore apply bleaches that are chlorine in nature as a last resort but ensure that you dilute them properly. The best stain removal treatment for cotton fabric are light acids like vinegar and lemon juice but other detergents may also apply. This type of fabric is usually very temparamental and you can treat the stains on this fabric with water rather than allowing the wet spot to dry by its own. 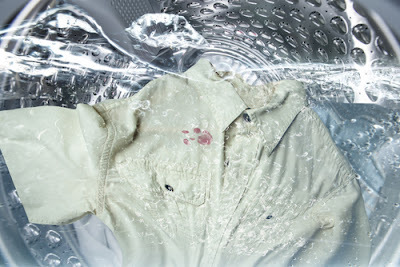 Ensure that you rinse the shirt thoroughly or else you may get water spotting hence becoming even worse than the stain. For the silk fabric, you can apply glycerin stain remover since it is neutral and effective. Treating synthetics may in regard of the material of the shirt. For the case of rayon and polyester, you can scrub and wash harsher than cotton. However, hydrogen peroxide and other oxidizing bleaches may destroy them. Therefore, it is advisable that you use a dish soap for the case of grease or heavy stains. Regardless of the fabric type you are working with, try and do a testing on the stain remover on the shirt. 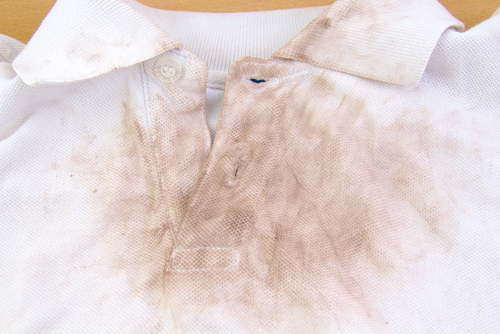 Before you apply the stain remover to your shirt, ensure that it does not damage the fabric. Only water can be used without testing but still it has to be at the right temperature. After you have tested and identified the fabric you are dealing with, you can now follow the following steps. Immediately you realize the stain on your shirt, soak it with water while putting on the shirt. You can dab the stain with water using tissue paper as soon as you can but ensure that the water is at room temperature. Ensure that the whole stain is soaked. Now remove the shirt and rewet the stain as you apply an absorbent like salt, talcum powder or cornstarch. Know that these absorbents only work best for cotton but salt might not be suitable for wool. Allow the absorbent to sit on the stain for about ten to fifteen minutes then rinse the rest of the absorbent with water after scrapping it off. Lightly apply your solvent on the shirt just underneath the stain. This is because you will want the solvent to soak through and drive back the stain to the surface rather than deeper into the fabric. Also applying the solvent to the inside gives you security in that if at all the solvent destroys the fabric it remains invisible. After applying the solvent appropriately, now lay the shirt a paper towel that is clean with face down. This will give the chemicals that cause the stains something they can soak into. The paper towel will also give the stain somewhere to go. Allow the shirt to rest there for around one hour. It is important to know that there are different reaction times for different solvents and therefore you need to give it time. You now need to give the shirt a final rinse to remove the solvent and the stain. If possible, wash it immediately either through dry-cleaning or taking it to a laundry machine. Understand that some of the stains can be removed simply by dry cleaning or by a wash but it is vital employ specific treatment also. For delicate silks or wool, the best thing will be water. However, if you feel that you cannot handle the stain removal by yourself, seek assistance from a professional laundry services in Singapore.